Wind vanes are ancient instruments, with their use recorded all the way back to the Roman Empire. Consisting of a simple design, wind vanes give onlookers an instant appraisal of wind direction. Farmers used wind vanes for centuries and, although they have been largely replaced with more modern devices in a function sense, wind vanes still provide decoration and an indication of which way the wind is blowing. A wind vane, also called a weather vane, is a rotating instrument that's usually found on top of buildings. Wind vanes can be both simple and advanced. The simplest of wind vanes employ an uneven surface area with an evenly distributed weight balance. This design causes the side with the larger surface area to be blown away from the wind while the side with the smaller surface area points in the direction of the wind. More advanced wind vanes use anemometers to measure wind speed and pressure. When an anemometer is combined with a wind vane, the resulting device is called an aerovane. While many types of anemometers exist, propeller-style anemometers are most often used on aerovanes and provide measurements that attest to the overall strength of the wind. The main purpose of a weather vane is to help assess the weather. Meteorologists then use these measurements to predict weather patterns. Knowing which direction as well as speed and pressure the wind is coming from can help weather forecasters predict when storm patterns and heat waves will arrive at a city or county. Meteorologists aren't the only people who need to know the wind direction. 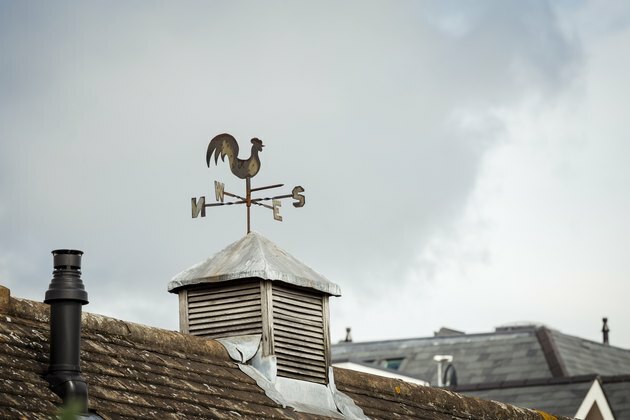 Weather vanes come in useful at homes or on farms in seeing which way the wind is currently blowing. The wind can affect a number of activities you might do outside. Horizontal bars on the weathervane show N, S, E and W to make it clear which direction the wind is blowing. Wind vanes continue to enjoy a decorative purpose on many buildings and homes today and appear in many styles and designs. They're often thought of as a timeless accent from the past that still has a place atop homes, barns, sheds and other structures. Simple vintage arrow wind vanes can be seen on old farmhouses, relics from a past when farmers used them to protect their crops. Intricate, hand-carved vanes made from hammered copper or iron are often found on the tops of museums and governmental or court buildings. Animals, objects and designs are used to top weather vanes and indicate something about the nature or function of the buildings upon which they sit. Wind vanes are also attached to boats as a navigational device. When a motor-powered boat's motor fails, or when a vessel is powered by wind through the use of sails, wind vanes become useful in keeping the vessel moving. A simple wind vane not requiring external power gives sailors a readily identifiable way to steer their vessels in the direction of the wind and towards a haven where they can safely repair their boat. Wind vanes with fixed compass settings beneath will help sailors know which direction they're heading, as well as which direction the wind is taking them, when other navigational instruments fail. Yet another use for this instruction is to improve your golf swing. A small, portable wind vane device snaps onto golf equipment bags to show golfers what direction the wind is blowing. This information may help golfers determine exactly how to aim and time their swing to maximize, or minimize, their distance for any given shot, with the ultimate goal of getting their balls into the holes in as few strokes as possible. How Does a Weathervane Work? What is the Origin of the Windsock?